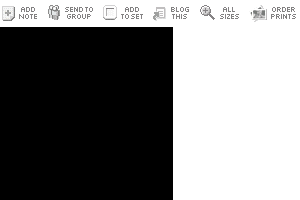 I uploaded a digital version of Kazimir Malevich’s famous Black Square to Flickr. Because of a bug in the uploader, it turned out entirely black. Malevich’s “Black Square” from 1913 is also called “dead square” by his contemporaries. To Kasimir Malevich, however, this square symbolized a “full void,” in that it shown how painting could fulfill itself unaided by any reference to a specific external reality. For him the square represented pure Suprematism: “the supremacy of pure feeling” in and of itself. Malevich removes subject matter as such by shifting away from representation and mimesis and towards the purity of geometry. Malevich’s original (actually there were four) was not entirely black. By many visitors and critics throughout the decades stated the vibrant color of the painting. It was never seen to be entirely black. The accidentally created Flickr version however, is #000000 all over. 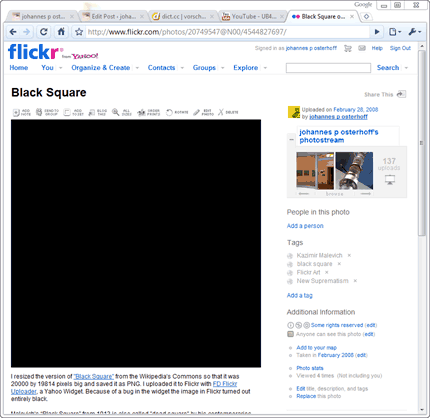 See Black Square on Flickr. My painting Black Square 2.0 also deals with the famous painting and reveals that pure geometry even in the most calculating medium has become a rare occurrence.